look: He has brown short hair with silver eyes. 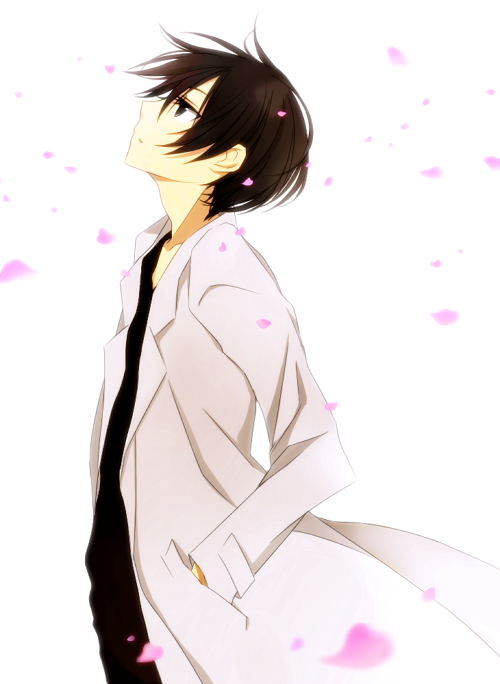 He wears a labcoat with a black buttondown shirt and black pants. Attacks: Ummm..his attacks are pretty flexible, so it’s kinda hard to do this part. Combat style: He is based on adaptability and he tends to try and play things on the safe side. He doesn’t like to take many big risks, but he will if he feels like he must. He fights an opponent and gages the best way to defeat them, then uses his powers to exploit their weaknesses or to follow a strategy he came up with. So basically, his fighting style depends upon who he’s fighting. History: Hiashi lived with his family until his mother got cancer. Then he left home and signed himself up to be experimented on, so they could afford Chemotherapy.he was put in the lab that would eventually make Korosu and experimented on to find immortality. Once Korosu was made he made quick friends with her and named her Miyuki. They lived happily together until she was forced to leave. When Korosu tried to come back the government freaked out, thinking that she went rogue, and killed everyone who was in the lab. Everyone except for Hisashi, who had merely been knocked unconscious. When he woke up he remembered the promise he had made to Korosu’s “father” and immediately tried to locate her. He became a detective and worked his way through the ranks to gain access to the classified information that would tell him what happened at “father’s” execution. He soon learned that Korosu was put into and had broken out of jail. His first lead in his new job to locate and capture Korosu was a report from the police. They had spotted Hiashi’s family housing Korosu and killed them, but failed to capture Korosu. The next few leads that came were murder scenes where entire cities had been wiped out. Before he could visit the city most likely to be hit he visited a boy who was born with one of the same abilities that Korosu had: the ability to manipulate plasma. The boy was only a teenager, but he hoped to one day lead a small group that would bring Korosu to justice. When he came back to headquarters he was told that his job had been changed to making new ideas for high-tech-security. He helped for a bit, but he eventually left since his job was no longer helping him. He went back to the boy that shared powers with Korosu and joined his group. He made his special buttons to gain the trust of the group, who he had planned to betray, but in the end he fought with them against Korosu. They all died, but he somehow managed to survive. This time instead of trying to case after Korosu he lived a normal life. Soon the attacks stopped and he got an invitation the mail. He decided accept the invitation and met a young girl, who was an oracle, and she told Hisashi that he would become the leader of a great organization that would eventually pull Korosu’s soul out of Minea, give it it’s own body, and then flee to a lonely world. She also told him that he would start his path as soon as the girl turned 18 and that the girl would accompany him on his journey. That was when he began to recruit people from many different worlds to assist him in his job. Eventually he had made a giant organization with millions of members and after awhile they were able to capture Minea. They experimented on her and eventually managed to make Korosu surface, but at the price of a world. Ever since that day they’ve constantly been casing Minea around and trying to capture her. However, Hiashi began to doubt if what he was doing was really for the greater good when he saw the mess he had caused and the pain he was putting Minea though.